Even when making home improvements, most households have strict budgets that must be adhered to. We have reviewed the top toilets available in the range of $500 to $1000. The range includes designs and features to suit most buyers’ lifestyles and requirements. The air switch located on the top of the bowl will activate both the flushing system and the macerating pump system. The unit uses only one gallon of water per flush (GPF). Available in cotton white, this unit has a high-profile tank with a front-mounted chrome flush lever. The skirted bowl finishes the look and enables easier cleaning. The Champion 4 flush valve is the biggest in the industry at four inches, allowing water to flow into the bowl from 360 degrees in one second. The toilet uses just 1.28 GPF, but still packs a Maximum Performance rating of 1000 grams of waste per flush. This is the highest rating for a single flush. 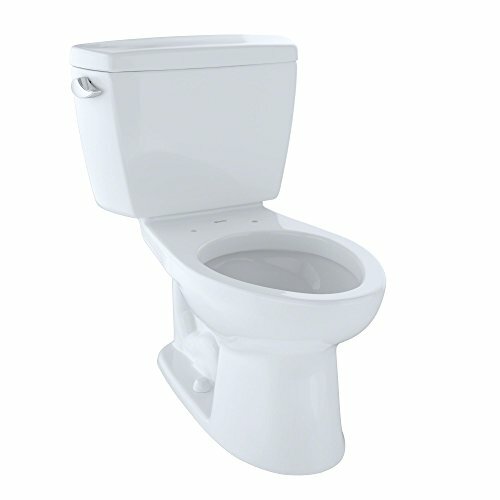 It has a compact bowl meaning that this toilet can fit into an area that would normally only accommodate a round bowl. Champion 4 can flush away 70% more waste than the industry standard, with the highest waste removal rating of 1000 grams per flush. This one-piece toilet includes a macerator in the base. It is a specialist product designed for installation in areas that would not normally support a bathroom. It has a sleek and smooth classic design, making it easy to keep clean. The vitreous china construction is available in white. It has no external water tank. Because this toilet is self-supporting, it can be installed just about anywhere, from an outside shed to a small place under the stairway. The toilet is equipped with a pump that is capable of driving water nine feet vertically and 100 feet horizontally so it does not have to be installed right next to the sewer line. The flush system can manage effluent from both a toilet and a handwash basin. The air switch located on the top of the bowl will activate both the flushing system and the macerating pump system. The unit uses only one gallon of water per flush (GPF). The water usage is electronically timed. The toilet seat with two chrome hinges is included in the purchase price. The discharge elbow has a non-return valve attached to it. It is able to rotate 360 degrees so that installation is possible in hard to reach places. The toilet requires no venting. The product has a warranty that covers it for two years from the date of service. This one-piece toilet with an elongated bowl has a decorative design. Available in cotton white, this unit has a high-profile tank with a front-mounted chrome flush lever. The skirted bowl finishes the look and enables easier cleaning. One-piece toilets are easier to keep clean because there are fewer creases where bacteria and dirt can accumulate. The skirted bowl, the one piece construction and the SanaGloss finish work together to deliver a toilet that requires less cleaning, reducing the need to use harsh chemicals. SanaGloss—TOTO’s patented glaze—creates an ionized barrier that actively repels dirt, bacteria and mould and protects the unit so that the color and high gloss are retained for years. The SoftClose seat is included in the purchase price. This seat has been specifically designed to avoid seat slamming. The hinges, attached to the seat and lid, are designed to close gently every time. The seat has been ergonomically designed to offer maximum comfort. It is moulded from high impact polypropylene, a high gloss plastic that can withstand chemical cleaners. The toilet is equipped with a Double Cyclone flushing system, which uses just 1.28 GPF. This system makes use of a double nozzle that powerfully drives water into the bowl, creating centrifugal force that cleans the toilet perfectly every time. This toilet has a one-year limited warranty and is ADA-compliant. This toilet is a single-piece unit with an elongated seat. It has a high-profile tank and is available in bone. It has a chrome-plated activation lever mounted on the front of the tank. The smooth and sleek exterior of the unit makes for easy cleaning, assisted by the EverClean finish, which prevents the build-up of bacteria, mould and mildew, reducing the need for harmful chemicals. Bacteria are known to cause odors and discoloration. EverClean protects the color and shine for years. The seat is not included with this purchase, but two color matched bolts are. The Champion 4 flush valve is the biggest in the industry at four inches, allowing water to flow into the bowl from 360 degrees in one second. Combine this with the largest trapway in the industry and the result is a toilet that independent Maximum Performance tests have proven cleans the biggest bulk 1000 grams per flush. The flush actually moves masses 70% bigger than the industry standard. The accelerator flush valve cleans the bowl quickly, eliminating streaking. This product has a ten-year limited warranty. This stately toilet looks somewhat different from the norm. It has stark, straight lines and a decorative pedestal and lid. Available in linen, white and bone, it is a one-piece construction and has a skirted trap way making it much easier to keep clean. It has a Right Height seat, meaning that it is the height of a standard chair. This makes it much easier for adults to sit down and rise from the seat. The Duroplast slow-close seat and lid are included in the price. The toilet uses just 1.28 GPF, but still packs a Maximum Performance rating of 1000 grams of waste per flush. This is the highest rating for a single flush. This toilet boasts FloWise technology. The PowerWise rim of the toilet is pressurized and when the flush is activated, the water is released under pressure. The three-inch flush valve further assists the flow of water. The standard valve width is two inches so the extra width allows 80% more water into the toilet. This product has a limited ten-year warranty. This one-piece toilet has classic easy-to-clean lines. It is available in ice grey and has an elongated seat. It has a compact bowl meaning that this toilet can fit into an area that would normally only accommodate a round bowl. The chrome-plated lever is attached to the side of the tank. The Comfort Height seat makes sitting down and rising much easier for adults, as it is the height of a standard chair. The AquaPiston flush forces water into the bowl from all angles, creating a quiet and powerful flush that only uses 1.28 GPF. The canister covers 90% of the seal ensuring a leak-free toilet. The product has a one-year limited warranty. This one-piece toilet has an elongated bowl and a high-profile tank with a classic design. The smooth outer shell ensures that there are no crevices where bacteria and dirt can accumulate. The porcelain is protected by American Standard’s EverClean glaze, which protects the finish from bacteria, mould and mildew that can cause nasty odors and discoloration. EverClean ensures that the finish retains its bright color and glossy appearance for years. The chrome-plated flush lever is mounted on the front of the tank. The product is available in white. The seat is not included in the purchase price, but the color matched bolts are. This unit boasts the Champion 4 flushing system. The flush valve, at four inches, is the biggest in the industry. This combined with the biggest trap way in the industry results in a quiet yet powerful flush. Champion 4 can flush away 70% more waste than the industry standard, with the highest waste removal rating of 1000 grams per flush. It uses 1.6 GPF. This product comes with a ten-year limited warranty. This one-piece construction, available in white, bone and linen, has an elongated bowl and high-profile tank. The chrome-plated activation lever is mounted on the front of the tank. This is a Right Height toilet, meaning that the toilet, unlike the standard toilet, is the height of a regular chair, making sitting and standing much easier for the adult user. Keeping this toilet clean should be a breeze, as toilets with a one-piece bowl and tank have fewer crevices where dirt can accumulate, and therefore require less cleaning effort. In addition, EverClean glaze protects the vitreous china tank and bowl. This proprietary finish prevents the growth of bacteria, mould and mildew, some of which can cause bad odors and discoloration. The EverClean finish will ensure that the toilet remains glossy and bright for years. This toilet is ADA-compliant. The seat is not included, but the color matched bolt covers are. The flushing system on this toilet packs a lot more punch than most others. The Champion 4 flushing system boasts the biggest flush valve in the industry. This four-inch valve is paired with the biggest siphon trapway in the industry. Together they are capable of flushing 70% more waste from the toilet than a regular toilet. Independent tests gave Champion 4 the highest Maximum Performance outcome of 1000 grams. This product has a ten-year limited warranty. In this price range there is a comprehensive range of toilets to fit the lifestyle requirements and budget of any prospective buyer. We hope that this review has helped to make your choice easier.